What is ‘a portion’ of fruit and veg? I really like the BANT Wellness Solution. It gives you clear guidelines as to what you should be eating on a day-to-day basis. Obviously, the suggestions are an outline, not an individual approach, and what suits one person, may not suit another. Some people, because of particular health issues, might struggle with fats or with too many fibrous vegetables (this is one area where I come in as a nutritional therapist, to find out the potential root causes for digestive issues such as these). However, for those who are healthy, or who want to improve their overall wellbeing, this plate is a great place to start. People often ask me what a portion actually is. There are some great resources that can help with this, and I’ve linked them below. However, for a quick and easy visual approach, a portion of fruit and vegetables is how much you can fit into the cupped palm of your hand. So in terms of broccoli, this will be a couple of spears; for green peas, this will be about 3 tablespoons. For green leafy vegetables, however, it is slightly different – it is a compressed (measuring cup) when raw. A portion is not mounds and mounds, as some people imagine, so it is easier than you think to fit in your daily requirements. 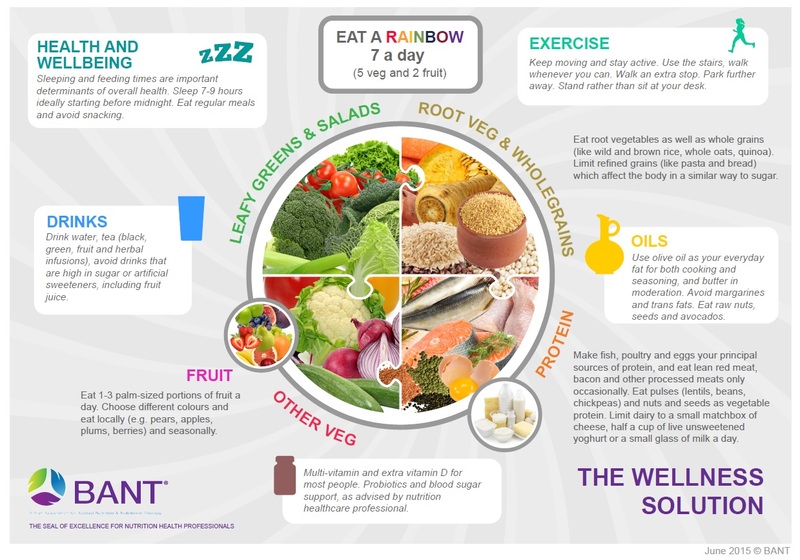 In terms fruits and vegetable consumption, government guidelines are still 5-a-day, whilst the BANT plate suggests 7-a-day. Recent research has also found that 10-a-day is optimal. Though I wouldn’t suggest stressing yourself about getting in so many portions if your day is busy and it is difficult for you to do so, always bear in mind that health outcomes do improve for every portion you add to your day. I’d say that whenever you can, try to eat the higher limits of vegetable foods and when you can’t, just do your best. For me personally, I feel at my best when I eat around 10 portions of fruit and vegetables a day, but some days, it just ain’t happening. (Having said that – it is much easier to do so when you eat a plant-based diet anyway). So here are the links I mentioned earlier. Next time, I’ll be talking about about my new love… my soup maker! If you found the information here useful or if you have any requests for future blog-posts, please click on the title and comment at the bottom of the post. Next PostRoll Up! Roll Up! NT in Local Paper!